When I started photography, I was experimenting with shooting various cliched scenes like some girl in focus with a blurry background, landscapes, flowers, street life and more landscapes. However none of these appealed to me as I didn't want to be seen as the 'cliched photo guy'. Also all those scenes just make me look more like the typical Asian tourist! I doubt I would have found photography if it wasn't for a gym related accident. I was at a local MMA gym trying to get some extra training. I got paired up with a nut case doing wrestling drills and he ended up doing some retarded move which made him fall on top of me, twisting my foot in the process. I was only around 60kg and he would probably be at least 80kg. I was pretty sure my ligament muscle was torn and I remembered the coach just saying, "Well, it's not like it's going to get better or worse, so just get back onto the mat and use your other leg" I could barely drive home and this injury kept me indoors for about a week and a half. During this time I decided to pick up my dad's camera and have a play. A couple months later I started bringing the camera to my regular gym at Nemesis Martial Arts to experiment. I tried to replicate the photos that I've seen in the IK mags - hoping one day I might get published there. Eventually my trainers got me into shows with them when some of our guys were fighting. It gave me a different perspective of the fight game. I've been to shows as a spectator and fighter in the ring but shooting was something of its own. 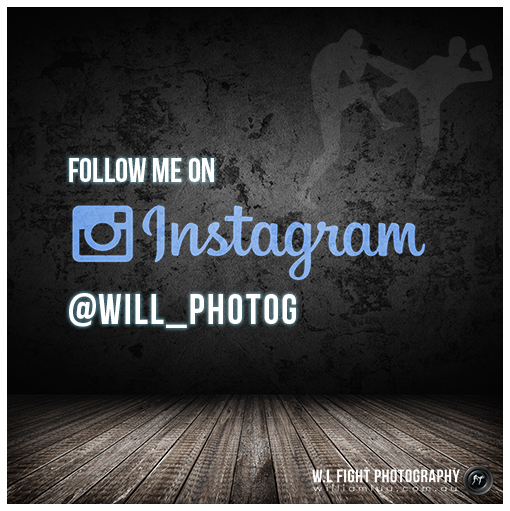 Now almost 2 years later, I've been keeping active by working on numerous fight shows around town. It would be nice to land some interstate gigs as well. One of my main goals now is to land some work in the design field. I'll be graduating mid year and I'm looking to gain all the experience I can get. I've seen my share of lacklustre fight posters and thought that I could design a decent one. I had a chat with one of my promotors and he decided to let me take over the photography and graphics department. I figured, since I'll be graduating as a Graphics Designer in a few months, I should start getting work and adding to my design portfolio. I hope to have some more fight related design work completed and published this year. It's been about a week and I finally configured and got my website working. This was all thanks to the 24/7 365 response team at Squarespace. I would have liked to have used william.com but it's currently being used by another person who just has that directed to their Flickr account. I was lucky enough to find william.com.au, which worked out better as it went well with my watermark. I guess it's time to finally upgrade my website. When I began this photography gig in late 2011 I decided to start on a wordpress site. I soon found out that I wasn't getting the traffic that I wanted and decided to focus entirely on Facebook. At the time I remembered how I was so excited to reach 100 'likes'. After working hard to promote myself on Facebook, I decided it was time to work on my website. I thought I'd give Squarespace since I'm a big fan of the powerful Joe Rogan Experience podcast and have already become an Onnit customer.